Malware spam: "Please do confirm the Quote Price and get back to me as soon as possible"
Please do confirm the Quote Price and get back to me as soon as possible. That IP address might be worth blocking. The Hybrid Analysis indicates that this steals FTP and perhaps other passwords. This is a Pony loader which will probably try to download additional malware, but it is not clear what that it might be. 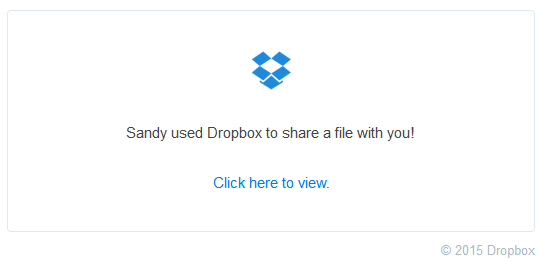 This fake Dropbox spam appears to come from randomly-generated people..
Sandy used Dropbox to share a file with you! 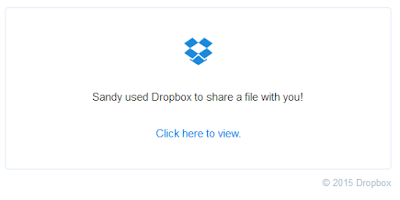 The link in the email actually goes to sharefile.com where it downloads a file Amendment or the Agreement_09-11-2015.zip containing a malicious execitable Amendment or the Agreement_09-11-2015.scr which has a VirusTotal detection rate of 2/54. Automated analysis is inconclusive   but you can guarantee that this is nothing good. Because of the low detection rates, it might be worth temporarily blocking sharefile.com. My sources (thank you!) say that this is Upatre dropping the Dyre banking trojan, dropping a DLL with a 2/55 detection rate. The comments in that report also contain a list of IP address that you might want to block. Please open the attached file to view correspondence from Transport for London. Attached is a file 6305093.zip of which I have seen just one sample, containing a malicious executable 6305093.scr (MD5 6a4cce90ba28720fa9e6813f681b1f75) which has a VirusTotal detection rate of 7/54. This Hybrid Analysis report shows it communicating with the well-known malicious IP address of 197.149.90.166 (Cobranet, Nigeria) which I recommend you block. The payload here seems to be Upatre dropping the Dyre banking trojan. Please find attached a copy of this invoice in PDF format for your records. (you will need your portal login details). top right of the invoice. instructions on screen to setup a recurring direct debit payment. Thank you for your business and we look forward to receiving your payment. 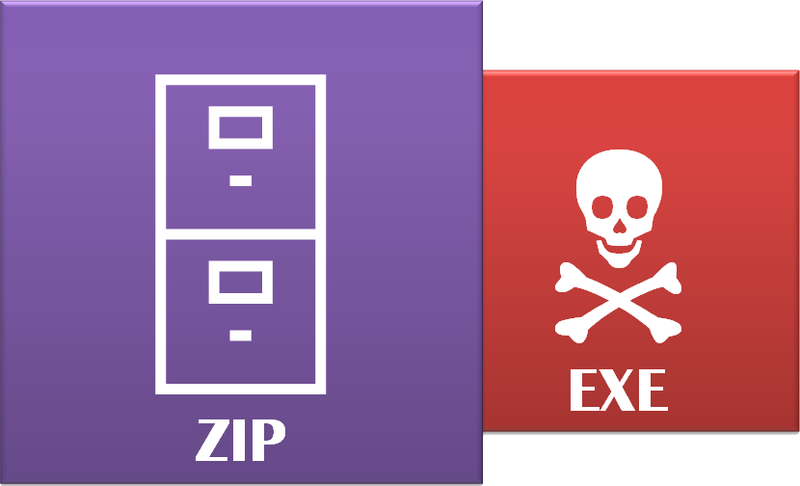 Attached is a password-protected ZIP file Invoice-241.zip (in the case, the password is UCZ941QXO941) which in turn contains a malicious executable Invoice-241.zip.exe (MD5 c5770e371cdfde80dc87187b249b19ea) which appears to be undetected at present. Analysis of the binary is pending, but it will be nothing good. Malware spam: "Don and Carol Racine" / "www.boatclinic.net" / "boatclinic@aol.com"
follow , Balance is due now ! The subject of the email is some randomly-generated sentence, which matches the name of the attached ZIP file. I have seen two samples so far with a detection rate of 3/55 and 2/55 respectively. Analysis of the binary is pending (please check back), but the payload here is Upatre/Dyre which commonly calls back to 197.149.90.166 (Cobranet, Nigeria), an IP I strongly recommended that you block. The reverse.it report shows that the malware does indeed call back to that Nigerian IP address. To view the message, please open attachment. The other version I had mentioned "QMDM - 5J673827 CDW Computer Centers Inc. - REFURBISHMENT" instead. The attachment appears to have a randomly-generated name e.g. REFURBISHMENT 7216378.zip and REFURBISHMENT 4435708.zip which contain a malicious executable REFURBISHMENT 7015295.scr which has a VirusTotal detection rate of 3/55. The payload appears to be Upatre/Dyre as seen earlier today. Please find attached your invoice for Week 38 2015.
the software Adobe Acrobat Reader. If you have any queries regarding your e-bill you can contact us at invoices@ebillinvoice.com. Attached is a file 28834_wk38_2015.zip containing a malicious executable 67482_wk38_2015.scr which has a detection rate of 2/56. Automated analysis is pending, but the payload is almost definitely Upatre/Dyre which has been consistently sending traffic to 197.149.90.166 (Cobranet, Nigeria) for some time now, so I suggest that you block or monitor that IP. In the only sample I have seen there was an attachment SalesOrderAcknowledgement_EF150085.zip which in turn contained a malicious executable SalesOrderAcknowledgement.scr which has a VirusTotal detection rate of 3/55. The Hybrid Analysis report shows that amongst other traffic, it communicates with a familiar Nigerian IP of 197.149.90.166 (Cobranet). 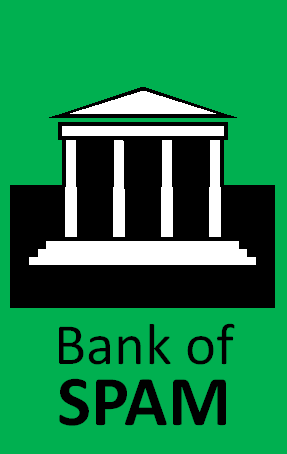 In this case, the payload is Upatre downloading the Dyre banking trojan. Attached is a file Fax-3901535011.zip which in turn contains a malicious executable Fax-800312316.scr which is exactly the same Upatre/Dyre payload as seen it this attack also seen today. The "case number" is random, and is reflected in the name of the attachment (in this case Case_0676414.zip) which in turn contains a malicious executable Case_0043258.scr which has an icon to make it look like a PDF file. 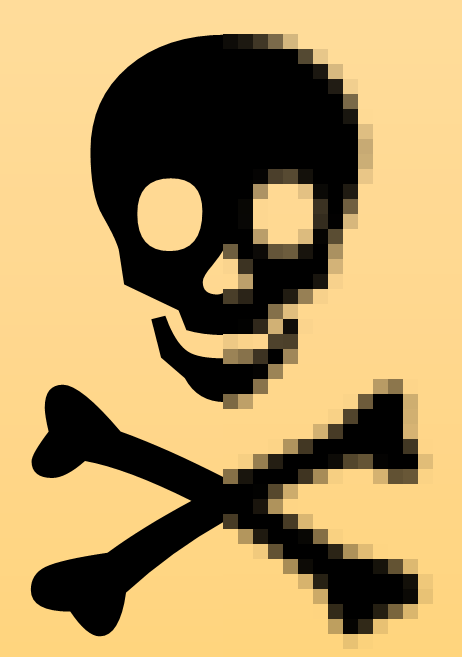 This executable has a detection rate of 4/56. The Hybrid Analysis report shows that it communicates with 197.149.90.166 (Cobranet, Nigeria) which has been seen handling malicious traffic for the past couple of weeks. The payload is Upatre/Dyre. 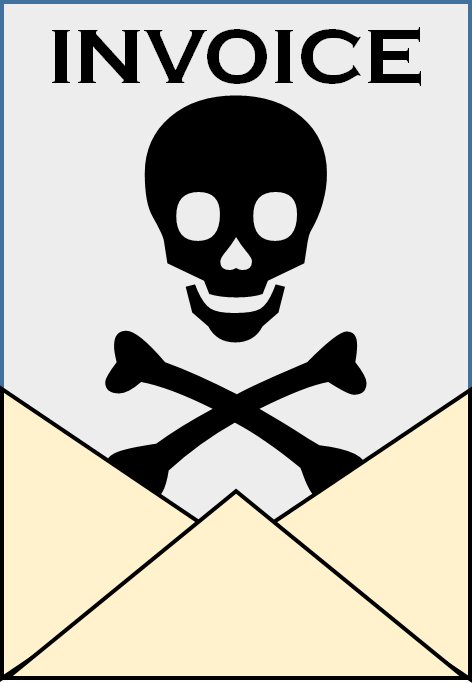 Malware spam: "Private message notification 41447" / "Adrien Abbott"
You've received a private message. Please open the attached to view it. ..which is an IP that has been used several time for this sort of attack recently and is worth blocking. The report details other IP addresses too, but this seems to be the key one to block or monitor.